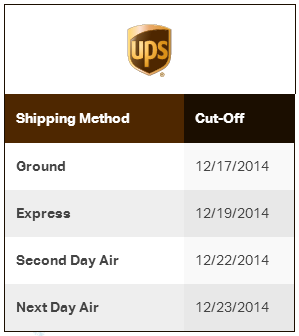 Following are some important dates to keep in mind when buying and shipping packages this Holiday season. Make sure to get your purchases and gifts delivered on-time to family, friends, and others. Here is a round-up of this season's cut-off dates from USPS, FedEx, and UPS to get packages delivered in time for Christmas Day. 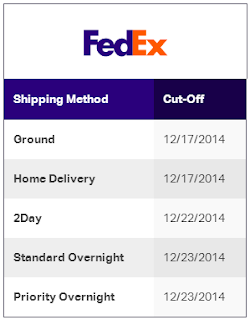 Use these dates to set your own cut-offs so you have plenty of time to get customer's shipment on their way. Keep in mind that weather, natural disasters and unforeseen circumstances can affect these dates. To avoid disappointment, buy and ship as early as you can. There are many flashlights on the market today, being produced both here in the USA and coming in from foreign countries. The basic components of a high power flashlight are: luminant, battery, circuitry, body housing, reflector, circuit board, switches and other components. So How Should We Judge the Value of a Flashlight? The body of a flashlight is divided into three types: common oxidation, hard oxidation and HAIII hard oxidation. The first is the most common being used in flashlights today while HAIII hard oxidation costs the most. While the manufacturing process produces some defective bodies. (Bodies considered B-class have a small amount of defects that do not affect appearance and C-class are considered highly defective. ) These defective bodies should be recycled or sold only as seconds. The interior details and material of the body should be inspected. Many flashlight tail caps are poorly made and easy to break, so are switches. A good quality flashlight is equipped with a copper lamp holder with super heat radiation. Small-sized flashlight needs the most. The more accessories on a flashlight, generally the higher quality. While the cheaper ones have a very simple build with only a few options, this is because of reduced build costs and short cuts in the building process. For example, most tail caps use a spring, but better built ones use a copper spring that has a long life and provides good connectivity. The price of LED’s and circuitry varies greatly. The price of quadrinucleate is the most expensive, followed by CREE mononuclear. Tthe price from low to high is that Q5→R2→R3→R4→R5→T6→U2→L2-T6→L2-U2. The more expensive the LED is, the larger the luminous flux. And finally, the circuit board has its own classification. The cheapest is made using a board without IC resistance (also called direct drive plate); The most common board in use has IC resistance and constant voltage or booster pressure; Higher quality boards have IC resistance and constant voltage. The best boards have constant voltage, various modes and full electricity etc.